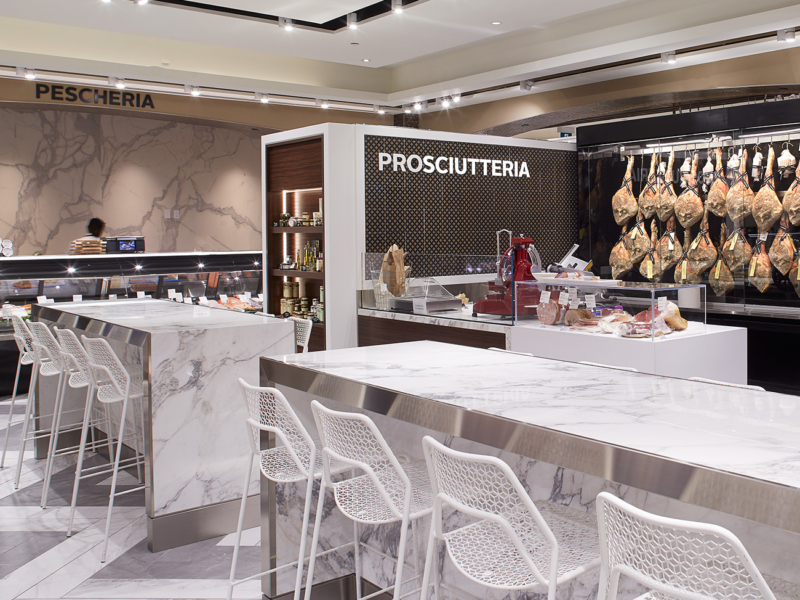 The first of its kind in North America, the Saks Food Hall by Pusateri’s features 18,500 sq.ft. of best-in-class gourmet food offerings showcased within a supremely luxe market atmosphere. At the base of the escalators, visitors are greeted with an open vista of the vast space merging the Saks menswear department with the Pusateri’s champagne bar at the entrance of the food hall. The layout is inspired by the traditional European food hall model, with culinary stations meshed throughout the space creating a dynamic interplay of shopping aisles with specialty stations. A signature large-scale herringbone floor pattern throughout the food hall provides the element of cohesion unifying all zones. Traditional Italian names were used to identify the various departments to harken back to Pusateri’s Italian heritage and origins.